For this DIY Christmas decoration, we're making light balls even more magical by adding silk floral stems and decorative accents. This is an easy project that might take you as little as 30 minutes, but the end result is really something special. In fact, this holiday light display is so pretty you might just leave it up all year long...and you can! We'll talk more about creating floral light balls for every season a little bit later, but first, we'll show you how we made our Christmas themed flower ball! 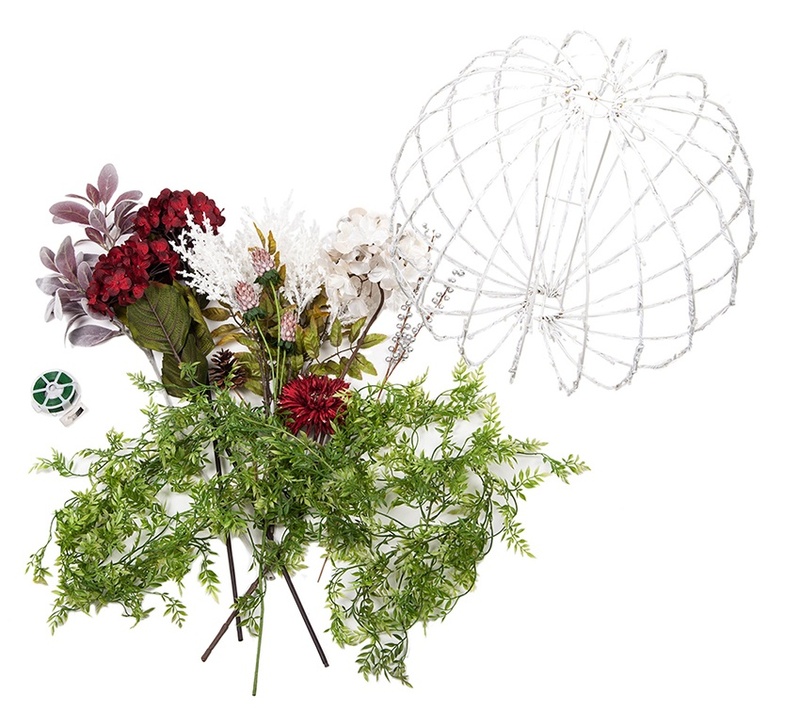 **We chose zip ties because they're a more durable option for holding floral stems in place than floral wire, however if your display is temporary or you don't plan to move your light ball around too much, floral wire works great! Whichever attachment method you use, be careful to attach stems only to the metal light ball frame and avoid pinching the light wires. We filled our Christmas light ball with florals and left very few gaps to see through the ball, however the method and density with which you choose to fill your light ball will vary depending on your personal taste. While layering the flowers on our light ball we could have easily stopped at any point and had a gorgeous display. That's the beauty of this project, the versatility is incredible! As noted in the supplies, we used a greenery filler to help fill out our ball, however if you wanted more light to shine through you could skip the filler and simply attach flower stems and accents to the exterior frame of the ball. 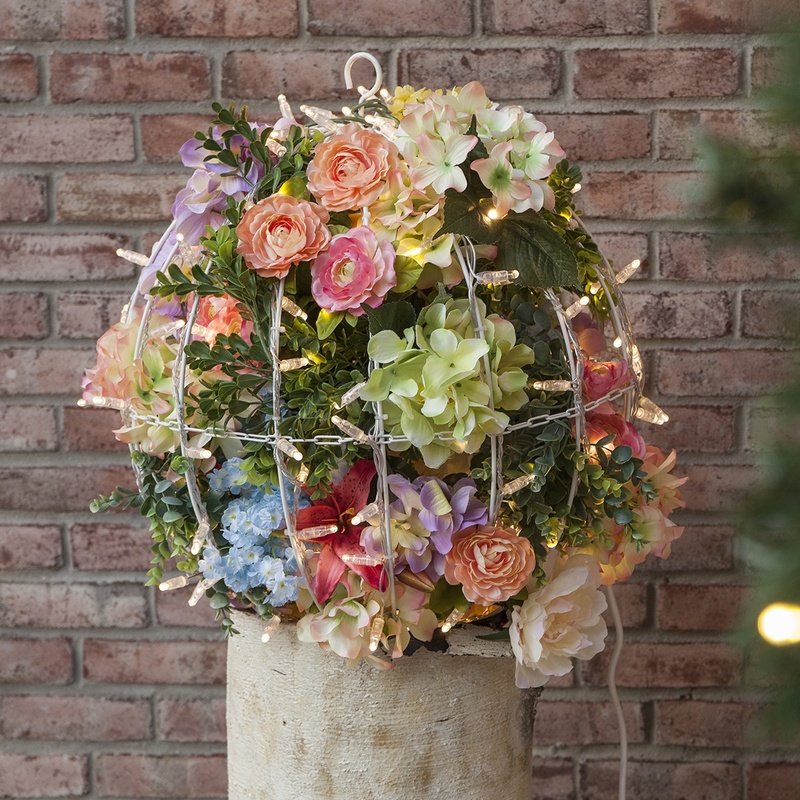 Additionally, if you prefer the uniform look of pomander balls, you could mimic this design by carefully arranging flowers of the same type together across your entire light ball. The steps below will take you through how we built our Christmas themed light ball and the types of floral stems we used. We started by attaching our greenery filler to the interior frame of the light ball using zip ties. For our greenery we chose to use boxwood garlands for their rich green color and unique texture, however eucalyptus garland or a more traditional Christmas variety will work just as well. Next, to fill in the gaps in the greenery we secured white and red hydrangea stems to the interior frame of the light ball. Hydrangeas and flowering bushes typically have larger blooms, making them an excellent filler flower. At this point the interior of the light ball was well filled and the combination of green, white and red was gorgeous. We could have stopped here and been completely happy with our display, but we found some fun accent flowers and stems at our local craft store that we couldn't wait to try out. First we attached lamb's ear stems with a beautiful burgundy hue to the exterior frame of the light ball, alternating the direction they pointed at every other bar. Then we added red gerber daisy picks and a few mauve cynara stems. Cynara are a visually striking plant which at first glance resemble something like a pine cone made of berries, this gave our light ball a fun and whimsical feel. Next we added a few silver berry clusters and sprays of white heather flowers which reminded us of snow. To finish it off, we encircled the top of the ball with pinecone picks. You might have noticed that many, if not all of the flower stems we used are not flowers found in traditional Christmas themed arrangements. While this wasn't planned, it does highlight our favorite aspects of this project: versatility and the ability to completely customize your design. The possibilities are truly endless. You may even find yourself going into the store with one color scheme or flower arrangement in mind, only to be inspired but something completely unexpected and have your display take off in an entirely new direction! For us, inspiration came in the form of lamb's ear and hydrangeas. These two caught our eye almost immediately and we knew we had to use them! 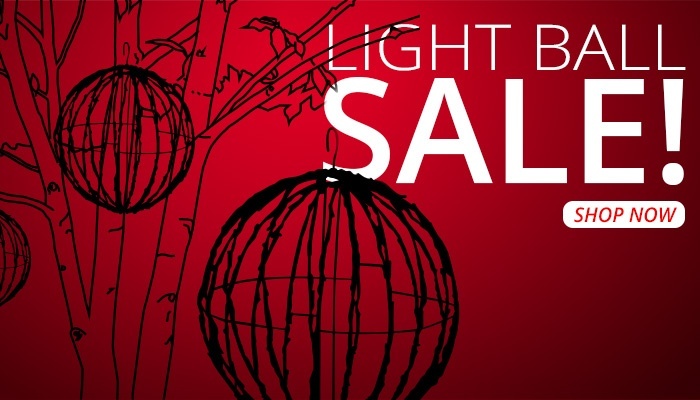 Before you head out to the craft store, take a look at our light ball decorating ideas below for more inspiration! Create a Spooky light ball by using purple or black Halloween themed garland and attaching spiders to the exterior of the ball. Use a bounty of bright flowers in place of Christmas accents to create a light ball bursting with the fresh colors and textures of spring! From start to finish, we had so much fun creating our Christmas themed light ball and we really hope you do as well! With all the creative possibilities this project has in store, we can't wait to see where your imagination takes you. Post your light ball project pics in the comments below and tell our DIY community the type of flowers and accents you used so we can make one too!